Netgear launched a new router today, the Nighthawk AC1900 Smart WiFi Router (R7000) which has a set of features as long as its name. Remember when routers were boring? Just some little box that sat there and moved data around and not much else. Slowly routers have become more intelligent, and the Nighthawk from Netgear just may be the most intelligent one yet. Sporting a dual-core processor, dual band Wi-Fi, a USB 2.0 port and a USB 3.0 port, the Nighthawk looks like a spaceship has landed in your home from the physical aspects, but inside is where the magic happens. Beyond just shuffling your data from place to place, the Nighthawk has the ability to prioritize different types of data with higher priority given to services such as Netflix, Hulu Plus and YouTube amongst others to make sure you have little to no buffering when watching online videos. You can also set the hardware to search your home network for gaming consoles, and should it detect any it will give those a high priority to make sure that you see as little lag time as possible in your online gaming. The little differences don't stop there, however, as the Nighthawk also wants to make sure your home network runs like a true network. Via the USB 3.0 port you can hook up an external hard drive and set up either Ready Share Vault for Windows PCs or Time Machine for Macs and make it into a centralized backup system for your entire home. If you want to access those files while outside of the home, or share them with someone else, that is also covered. Thanks to a free customized personal URL, you can set up a private FTP server to access the files on the connected external hard drive when away from home, or even the files on your connected computers. Coming some time later in the month will be a firmware update called Smartconnect which will help determine the best connection for each wireless device in your home with a heavy emphasis on mobile devices. As frightening as it may be, all of the abilities of the Netgear Nighthawk we've listed here are just a portion of what we covered when we did a briefing with Netgear prior to this product's release. It's rare that networking equipment gets you excited, but should the Nighthawk deliver on all of this plus a reliable connection, it's going to be a real winner of a device, and one any media consuming person would love to have in their home. We're hoping to bring you a review of the product in the very near future. 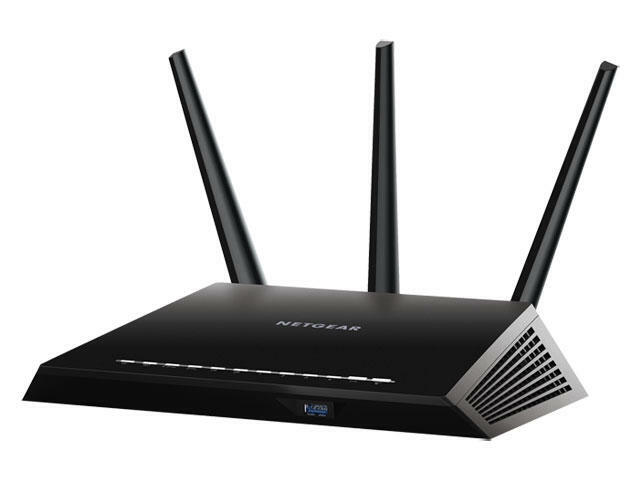 The Netgear Nighthawk is available now with a suggested retail price of $250, but looking around online we have found it for cheaper at several online stores.